Students will be able to exchange sufficient currency for goods. Ask students to think about times in their life they have received money. Students may talk about birthday or holiday gifts. They may also mention allowances. Try to guide the conversation to a time when someone was providing a good or service. Ask students to think about different goods and services people pay for. Help students to think about all the different ways people spend their money. Explain to students that one thing people need to buy is food. People go to a grocery store or farmer’s market to buy this food. Today, students will be using some fake currency to purchase some food in the classroom market. Take a moment to review with students the different values attached to pennies, nickels, dimes, and quarters. Students may also need a quick reminder about how dollar bills work. Next, ask for a student volunteer to go shopping with you. Show students some items with price tags you made on them. Ask the student which two items you should buy. 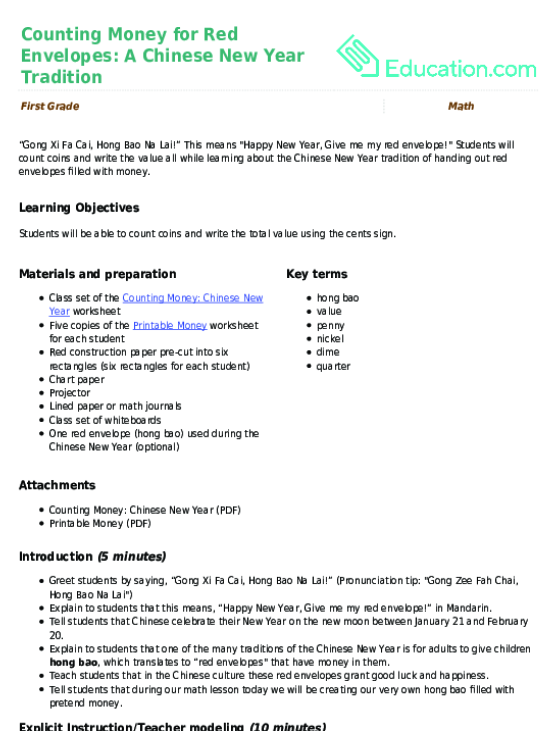 Guide the student through the process of adding the prices together and locating the correct amount of money. After the student volunteer has the correct amount of change, pretend to be the store owner or check-out clerk. Help the student to practice the conversation of asking how much something costs, paying for it, and getting any change. Repeat this process with student volunteers several times until the class seems to understand the pattern of choosing items, determining the proper amount of money, and paying for the items. Ask for a student volunteer to be the storekeeper and a different student volunteer to be the shopper. 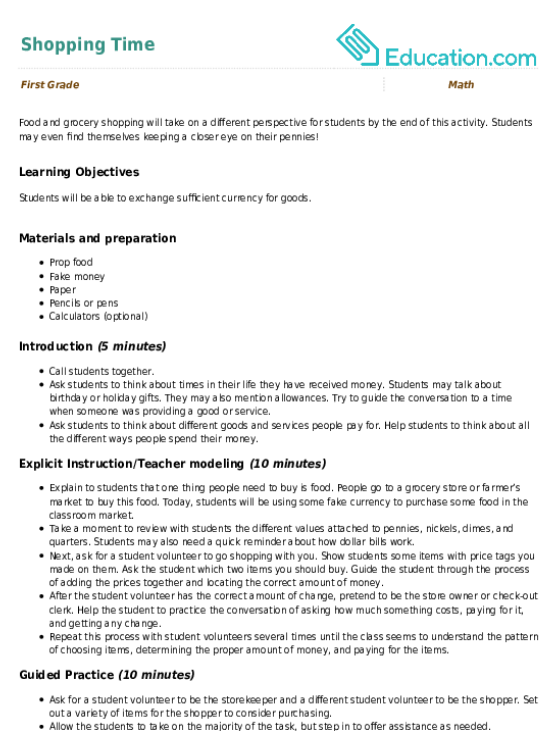 Set out a variety of items for the shopper to consider purchasing. Allow the students to take on the majority of the task, but step in to offer assistance as needed. This process should be repeated several times with different students taking turns as the storekeeper and shopper. Whenever possible, allow fellow students to assist with corrections or provide information when students are stumped. Finally, explain to the students any expectations you have for when they break up in partners or small groups to be storekeepers and shoppers. As students participate in the market, taking on the roles of buyer and seller, adults should be circulating, engaging in exchanges, and checking in with students to see how they are doing. It can be helpful to have students wait at their desks and come up 3-4 at a time to buy and/or sell items. This helps to reduce congestion. Additionally, students waiting at their seats can double check the exchanges occurring, so that students really are held accountable for saying the right things and exchanging the right amount of currency. Enrichment: To provide students with a greater challenge, encourage students to pay in as little or as many coins as possible. Another possible challenge is to haggle or negotiate the price of the item before paying for it. Support: For students needing greater assistance, pairing with a partner or adult can help to scaffold the lesson. Students may also enjoy using a calculator to check their math. 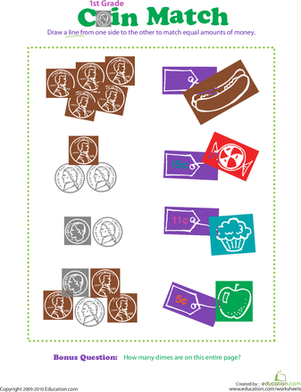 Visuals to remind students of the value of each type of coin can also be useful. To determine whether or not students have met the desired learning objective, adults should engage in at least one exchange with each student. The exchange should include appropriate dialogue as well as the proper exchange of currency. Call students back together. Have them share about their experiences shopping. What items did they get? Was there anything they were unable to afford? Did they ever run out of change? Have several students act out difficult exchanges for the class. Finally, encourage students to think about real life places where they could practice exchanging money for items. Encourage students to actively assist with choosing items and paying for them the next time Mom and Dad need to go to the store. Let's go shopping! 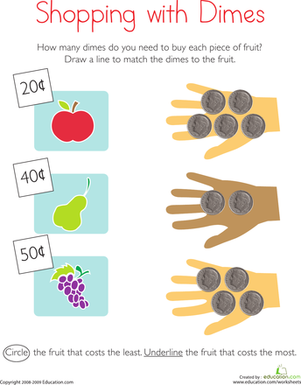 In this math worksheet, your kid will add up the value of groups of coins, then draw lines from coins to the items that cost the same amount. It's time to count the coins! 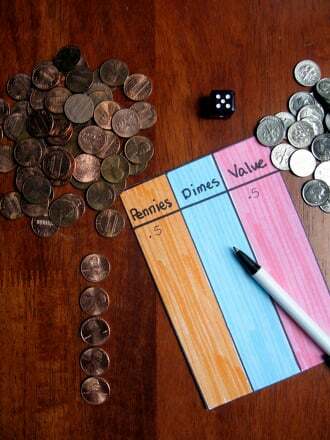 Practice adding up coin values with your youngster. 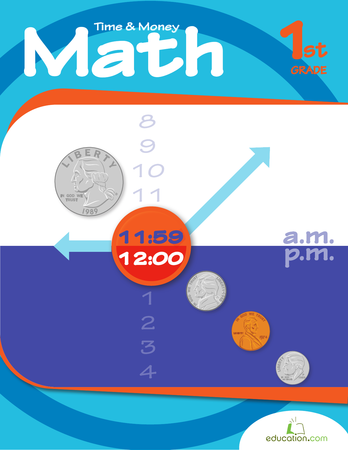 Learning to identify coins can be tricky at first, but with this matching activity your child will be an expert in no time!